Accurate measurement of pavement thickness is an essential aspect of the quality assurance of new pavement construction. Current methods involving the use of cores are time consuming and provide a very limited representation of the overall pavement structure. The overall objective of the work described in this paper was to rapidly determine the average pavement thickness on a newly constructed section to within 2.5 mm of the true value, without extensive reliance on cores. The effort was divided into two tasks-one for asphalt pavement and one for concrete pavement. The asphalt task has focused on two adaptations of ground penetrating radar (GPR), one involving the use of an air-launch horn antenna, and one using dual ground-coupled antennas in a common midpoint (CMP) measurement mode. The concrete task is focused on the GPR CMP method, and on adaptations of conventional impact-echo. The work included laboratory testing on small slabs and simulated pavement materials, testing at research pavement test facilities, and testing on actual roads in service in California. The pavement thickness data was correlated with thickness results obtained from over 200 cores taken at points in the test areas. The results show that, with proper implementation, the proposed methods can successfully achieve the desired objective. The paper describes the techniques, the testing d, and the results of correlation with core data. Pavement layer thickness is an important factor determining the quality of newly constructed pavements and overlays, since deficiencies in thickness reduce the life of the pavement. For asphalt,the relationships between thickness deficiency and pavement life have been quantified using a performance model (1). These relationships show, for example, that a 13 mm thickness deficiency on a nominally 91 mm thick pavement can lead to a 40 % reduction in pavement life. This reduction in pavement life has economic implications. The concept of "pay factors", which has been implemented for other quality measures (such as density), relates contractor payment to the economic consequences of these deficiencies. In order to implement pavement thickness as a measure of quality assurance and as a basis for pay factors, it is necessary to have an accurate and reliable method for making the thickness measurement. Cores are accurate, but they are time consuming, they damage the pavement, and they represent a very small sample of the actual pavement. Therefore, it is desirable to have a thickness measuring method which is quick, non-destructive, and which can generate a representative population of pavement thickness data points. Based on a pay factor analysis (1), the accuracy for the average pavement thickness should be within 2.5 mm. For asphalt pavement, ground penetrating radar (GPR) is by far the most established technology for measuring pavement thickness. Evaluation studies have been carried out by over ten state highway agencies, by SHRP, MnROAD, and by the FHWA, all of which have documented the accuracy of GPR asphalt thickness vs. core samples (2)(3). These studies have shown that for newly constructed pavements, the deviation between GPR and core results range from 2% -5% of the total thickness.Studies have also shown that, with proper equipment and data processing, GPR can accurately determine thickness for overlays as thin as one inch (4). GPR can be collected continuously at various speeds, and thus allow for the availability of a large number of thickness data points to be collected economically. Finally, GPR has also been effectively used to determine variations in asphalt density (5). Such additional information would enhance the overall quality assurance program. Most of these GPR layer thickness studies have been carried out with "air-coupled horn" antennas, since these can be implemented at driving speed without lane closures. However, for the purposes of quality assurance, lower data collection speeds permit consideration of "groundcoupled" antennas as well. This alternative introduces some interesting and potentially attractive options that will be explored during this program. For concrete pavement, the situation is different. The GPR wave attenuates more rapidly in concrete,especially new concrete, than it does in asphalt (6). This is due to the free moisture and conductive salts that are present in the concrete mix. Also, the dielectric contrast between concrete and base is much smaller than it is between asphalt and base. These two factors in combination often lead to a diminished, sometimes absent, reflection at the base of the concrete. Therefore, air-coupled GPR is not a feasible technology for thickness measurement on new concrete. Ground-coupled GPR, on the other hand, provides more energy input into the pavement, and can overcome some of the penetration limitations of the horn antenna. Mechanical wave techniques, such as impact-echo, work much more effectively in concrete.Concrete pavements are typically thick enough to fall within the measurement range of mechanical wave measurements. Mechanical waves travel well in concrete, and there is usually a strong mechanical contrast between the concrete and the base material. Data collection is considerably slower than with GPR, but certainly faster and less expensive than coring. Based on the background described above, the objectives of this project have been to develop,evaluate and test advanced air-coupled and ground-coupled GPR methods for obtaining accurate asphalt pavement layer thickness data, and to specify the use of these methods in the context of a quality assurance program. where velocity is calculated from ea ,the dielectric constant of the asphalt; t is the time delay between the reflections from the top and bottom of the asphalt, computed automatically from each waveform; A is the amplitude of the reflection from the top of the asphalt, computed from each waveform; and Apl is the amplitude of the reflection from a metal plate, obtained during calibration.The constant, 150, is half the speed of light in air. The factor 2 converts the measured round-trip time to one-way time. By fitting the observed data with this equation, both the pavement layer velocity and layer thickness can be determined. Fig 1: Principles of GPR Methods for Pavement Thickness Evaluation. Impact-Echo (IE) is standardized technique mechanical wave technique for measuring the thickness of concrete pavement (8), and several different sources of commercial equipment are available. A source and receiver are co-located on the pavement surface. The received amplitude-time signal is processed in the frequency domain to yield an amplitude-frequency plot.This plot is analyzed to identify the "thickness resonance", f, and the layer thickness is calculated as Vp/2f, where Vp is the p-wave velocity in the medium. The p-wave velocity, determined independently according to the ASTM procedure, is measured along the exposed surface of the material. The proposed accuracy objectives for QA may not be achievable using this procedure because the p-wave velocity measured at the surface does not adequately represent the velocity through the depth. In fact up to 6% difference in V can be expected between surface and interior concrete (9). Investigation of the influence of this procedure was one of the objectives of this work. Laboratory testing was carried out on simulated asphalt slabs representing three mix formulations and four different thicknesses using an oil/water emulsion. Four different asphalt thicknesses (25, 76,127, and 203 mms) were simulated by pumping the appropriate amount of emulsion out of a storage vat to cover a metal sheet placed at the bottom of a data collection box (10). The data from these tests confirmed that both the CMP method and the horn antenna methods are capable of providing the type of accuracy needed to achieve the stated QA accuracy objectives. For these two methods,the maximum deviation between calculated and actual thickness was 6.4 mm for a thickness range of 76 to 203 mm. Data at 25 mm thickness was difficult to obtain using either method. A 5 m long by 1.2 m wide by 533 mm deep test pit was prepared for testing asphalt slabs. Crushed stone aggregate was placed in the pit to four different heights (330, 381, 432 and 483 mm). Asphalt was placed on top of the base, so that four slabs of different nominal thickness (50, 100, 150, and 200 mm) were available for testing. This arrangement was repeated a second time with a different asphalt mix. The actual thickness values were confirmed by cores and were found to deviate by up to 19 mm from these nominal values. Tests were carried out on the asphalt slabs using the horn antenna and CMP methods. The data was analyzed for thickness, and cores from the test pit were correlated with the calculated thicknesses. Test results showed that the CMP method could not resolve layer thicknesses below 89 mm, while the horn antenna was capable of accurately measuring the 50 mm asphalt thicknesses layer. The methods were equivalent for thickness greater than 89 mm. A concrete slab representing four concrete thicknesses (155, 205, 254, and 305 mm) was cast in the lab. For convenience and access to the slab bottom, the slab was turned up on its side. Testing was carried out using two types of devices: one which measured both the thickness resonance and the surface p-wave velocity for the thickness calculation; and one which measures the thickness resonance only and used an assumed p-wave velocity. Twelve measurement points were defined on the slab, three in each thickness section, and three repeat measurements were made at each point.The differences between the impact-echo results and the known slab thickness showed some scatter (s = 12.5 mm), but the average difference was less than 2.5 mm with each device. The next series of tests were carried out on full-scale constructed pavements. One of these sites (I-93) was a newly constructed pavement, for which core data was available. The other sites (FAA,FHWA) were research sites, which were well documented with cores. The purpose of the tests was to verify and characterize the accuracy of the GPR and IE equipment and data analysis methodology. Fig 2: Equipment Setups Used for Pavement Thickness Testing. For the asphalt measurements, the horn antenna data collection was carried out using a portable "bike rack" arrangement mounted to a standard square receiver hitch at the back of a vehicle. The electronic distance wheel was mounted to the vehicle bumper (see Figure 2(a)). The CMPmeasurement setup, used both for asphalt and concrete, is shown in Figure 2(b). The CMP test rig had the two antennas mounted to a mechanism, which kept the antennas equidistant from the centerline, and electronically triggered data collection every two millimeters. The impact echo equipment used in these tests is shown in Figure 2(c). The GPR and IE data collected at these sites was correlated with core data. A total of 34 cores were available for correlation with the GPR and IE data. This correlation served as the basis for a final set of tests conducted on California pavements. thick and thin asphalt overlays. The concrete sites were selected to represent variations in concrete thickness and age. Age was selected as a variable because of its influence on GPR penetration and on p-wave velocity. Table 1 summarizes the California sites which were tested. At each site, a 305 m section was identified as the test section. For the asphalt sections, core locations were marked off at 15.25 m intervals in alternating wheel paths, such that there were 10 core locations in each wheel path and 20 core locations total at each site. The I-505 site, due to its termination at a ramp, was a 152 m site, and core spacing was at 7.62 m stations. For the concrete sections, the cores were located based on the IE data. Since all of the concrete sections had a lean concrete base (LCB), it was possible for the IE method to read the combined PCC and LCB thickness rather than the PCC thickness. Therefore, core locations were selected where a clear PCC thickness resonance was obtained. Table 1: California DOT Test Sites. For the asphalt sections, continuous data was collected a with the horn antenna at six inch longitudinal intervals on survey lines in each wheel path. Manual marks were placed in the data where the antenna passed over the designated core location. CMP measurements were made directly at the core locations, in both the longitudinal and transverse directions for both asphalt and concrete pavements. Impact-echo measurements were made on the concrete sections with two different pieces of equipment (see Figure 2(c)): (1) the "DOCter" manufactured by Germann Instruments ("DOC");and (2) the concrete thickness gauge ("CTG"), manufactured by Olson Instruments, Inc. The DOC has the capability of measuring the surface p-wave velocity, while CTG unit computes the thickness using an estimated p-wave velocity. Following the GPR and IE data collection, cores were taken in the pavement and stored for measurement and photographing. The preliminary data from I-93, FAA, and FHWA facilities was analyzed for pavement thickness and correlated with available core information. The results of this correlation for the horn antenna data are shown in Figure 3(a). The core data was not used for any type of calibration purpose. Fig 3: Preliminary Asphalt Test Sites: Core vs GPR Data. The horn antenna results for the three sites show a very good fit, with an R-squared of 0.98 and a slope very close to 1.0. The statistics of this data show a mean deviation between core and GPR data of 3 mm, suggesting a systematic tendency to under-calculate the actual thickness. The standard deviation of the deviation between GPR and cores is 8.9 mm. This value could be reduced with a correction to the bias described above. In a similar fashion, the California DOT horn antenna data was initially analyzed without reference to the core data. Once the GPR data was analyzed the core data was made available for comparison, as shown in Figure 4. The initial comparisons, shown in Figure 4 (a). shows that for certain sites there is a bias in the GPR data, which could be corrected by calibration. A method was developed for searching through the GPR data at each site to identify the optimal calibration core location. This method was applied to the data, and the calibrated results are shown in Figure 4(b). Although there is still some scatter, the use of the calibration core has created a regression line with a slope very close to one. Using the calibrated data, the mean GPR thickness data for each site is within 2.5 mm of the core values for four of the five sites, and within 4.3 mm for the fifth. The average absolute deviation from the core values for all 6 sites is 1.6 mm. Fig 4: California Asphalt Sites: Horn Antenna vs. Core Data. Figure 3(b) shows the correlation between CMP measurements and core data on the three test preliminary test sections. The regression line shows a tendency for the CMP data to overestimate the core thickness, and the R-squared shows more scatter than with the horn data. For the California DOT sites, the CMP data showed site-specific bias similar to the horn antenna, and one calibration core was selected from each site to correct for this bias using a scheme similar to that proposed for the horn antenna data. The calibrated CMP data is shown in Figure 5. Note that the CMP data shows a higher degree of scatter, particularly for the asphalt overlay site (US 180). Fig 5: California Asphalt Sites: Calibrated CMP Data vs. Cores. The average CMP data, after calibration with one core, is within 3.8 mm of the core average for each site, and the average absolute deviation from core value for all 5 sites is 2.6 mm. The laboratory tests and tests at the FAA research pavement, Vp measurements showed a great deal of scatter. The scatter is attributed to the subjectivity associated with the process of picking the first arrival of the p-wave. It was found in the laboratory, however, that the most accurate data was obtained by using the mean value of all Vp measurements for each local thickness calculation, rather than the local Vp number. Using this mean value, the average IE results for the laboratory slab were within 1.0 mm of the actual thickness, with a standard deviation of 5.8 mm. Tests at the FAA facility were not as successful. Using the same method based on the mean Vp velocity, the average IE thickness results for the 279 and 228 mm thick sections differed from the core values by 20 mm and 15 mm, respectively. The data from the California DOT sites was analyzed using both local and average Vp values. The California DOT data also suggested that the average Vp value for the site produced more reliable results than the Vp values at the individual locations. Use of the mean Vp value also produced better results than what was obtained by simply estimating Vp, as shown in Figure 6. This comparison is shows the DOC data using the mean measured Vp vs. the CTG data using an assumed velocity. The use of the measured velocity produces a regression line with a slope closer to 1.0 than is achieved with the assumed velocity, as one would expect. However, its accuracy, as measured per site by the difference between its mean value and the mean core value, is not close enough to meet the California DOT QA requirements. The final step in this analysis utilized one calibration core per site to calculate the Vp. The selection of the calibration core location was based on the repeatability of the frequency measurements with the DOC, and on the reported resonant peak quality factor "Q" obtained with the CTG. The core calibrated IE results show significant improvement, with a mean deviation for all five sites equal to 6 and 4 mm, respectively for the two IE methods. While this deviation is somewhat greater than the 2.5 mm accuracy objective proposed for pay factors, it is very accurate by other standards,and it might be workable for other aspects of QA. Fig 6: California Concrete Sites: Impact-Echo vs. Cores Without Calibration. The preliminary tests on the 228 and 279 mm concrete pavements at the FAA technical center showed that the CMP method was capable of determining concrete pavement thickness with reasonable accuracy. However, reflections from the boundary between the PCC surface and the lean concrete base were weak due to the minimal dielectric contrast. The results of testing on the California DOT pavements were not encouraging, particularly for young concrete. It was concluded from these results that the CMP method does not meet the proposed QA objectives for concrete pavement. This results presented in this paper show the effectiveness of several new methods for determining the thickness of asphalt and concrete pavement for quality assurance of new construction. The accuracy objectives for QA, particularly for pay factors, produced a very demanding accuracy requirement (2.5 mm) which has never been demonstrated previously with these methods. Three methods were evaluated: horn antenna GPR; common midpoint method (CMP) GPR; and Impact-Echo (IE). The evaluations included laboratory tests, tests on full scale pavement sections, and tests on newly constructed pavements in California. Test results were correlated with over 200 cores. The results show that for asphalt thickness, the two GPR methods, each used with one calibration core, meeting the accuracy specifications. The average absolute thickness deviation for the horn and CMP methods was 1.6 and 2.6 mm, respectively. 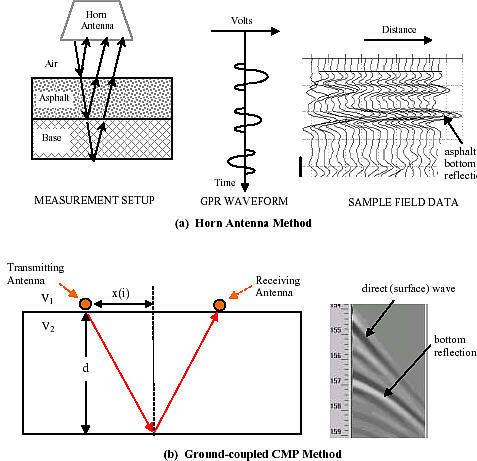 From an implementation point of view, the horn antenna method provides more data and area coverage for the same amount of effort than the CMP method. For concrete pavement, the impact-echo method, also used with a calibration core, comes close to meeting the accuracy specification. The average absolute deviation was 6 and 4 mm, respectively, for the DOC and CTG equipment used in these tests. The CMP method, on the other hand, did not achieve the required accuracy, and in some cases was unable to make a measurement. The authors would like to acknowledge: Doria Kutrubes of Radar Solutions International (RSI) for her assistance with the collection of the GPR data; Laura McGrath of Infrasense for her assistance with data analysis; Paul Foxworthy of Infrasense for his assistance in arranging access to sites and obtaining core data; Alex Gibson of the University of Illinois for his assistance in collection and analysis of impact-echo data; and Alfredo Rodriguez of California DOT for his assistance in conducting the field tests. The authors would also like to acknowledge Geophysical Survey Systems,Inc. and Worcester Polytechnic Institute for providing test facilities; Olson Instruments, Inc. for providing test equipment, and California DOT for their support of this work. Deacon, J. A., C. L. Monismith, and J. T. Harvey "Pay Factors for Asphalt-Concrete Construction: Effect of Construction Quality on Agency Costs" Technical Memorandum, TMUCB-CAL/APT-97-1, April 1997. Maser, K. R., "Pavement Characterization Using Ground Penetrating Radar: State of the Art and Current Practice," Nondestructive Testing of Pavements and Backcalculation of Moduli: Third Volume, ASTM STP 1375, American Society for Testing and Materials, West Conshohocken,PA, 1999. Wenzlick, J. T. Scullion, and K. R. Maser "High Accuracy Pavement Thickness Measurement using Ground Penetrating Radar" Report No. RDT 99-003, Missouri Dept.of Transportation,February, 1999. Maser, K. R., and T. Scullion "Influence of Asphalt Layering and Surface Treatments on Asphalt and Base Layer Thickness Computations using GPR" TTI Report TX-92-1923-1,September 1992. Saarenketo, T. and P. Roimela, "Ground Penetrating Radar Technique in Asphalt Pavement Density Quality Control". Proceedings of the 7th International Conference on Ground Penetrating Radar, Lawrence, KS, pp. 461-466, May 27-30, 1998. Halabe, U., A. Sotoodehnia, K. R. Maser, E. A. Kausel, "Modeling the Electromagnetic Properties of Concrete",ACI Materials Journal, Volume 90, No. 6, pp. 552-563, November-December 1993. Ulriksen, C. P. F., "Applications of Impulse Radar to Civil Engineering", published by GSSI, N.Salem, NH, 1993. Standard Test Method for Measuring the P-wave Speed and Thickness of Concrete Plates Using the Impact-Echo Method (ASTM C1383). Annual Book of ASTM Standards, Volume 4.02,ASTM, West Conshohocken, PA, 2000. J.S. Popovics, et al. "One-sided stress wave velocity measurements in concrete," Journal of Engineering Mechanics, Volume 124, 1998. pp. 1346-1353. Maser, K. R., Holland, T. J., and Roberts, R., "Non-Destructive Measurement of Layer Thickness on Newly Constructed Asphalt Pavement". Proceedings of the Pavement Evaluation Conference 2002, Roanoke, VA, October 21-25, 2002.